Giant Metal Chicken of Death vitrual cache! 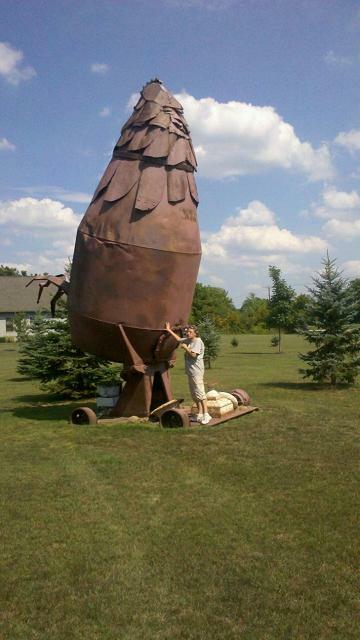 If you have ever walked along the Erie Canal towpath east of Lockport, you have probably noticed a giant metalic chicken at a near by fruit farm. Why it's there, I don't know. It may be there to scare off birds or prevent children from stealing apples. Perhaps it wards off evil spirits. I do know that the thing is darn tall. I have not spoken to the owner so you cannot access the property for a close up. If you wish to have a closer look, you do so at your own risk. The thing is large enough to see from the canal pathway. To log this cache, head to the posted coords and look to the north (away from the canal). Then you need to take a picture of yourself on the trail with the chicken in the background. 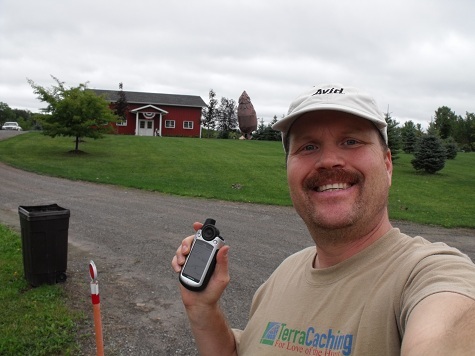 If you are camera shy, a photo of your GPS with the chicken in the background will do. Also, email/PM me how high you think the Giant Chicken of Death is. 3407. I specifically remember when this one was published. Glad to finally get by and see this in person. Very cool. sfcchaz in front of the Giant Metal Chicken of Death. That thing is really a chicken? Where it's head? Surprisingly I've never seen this oddity before, I guess because I've never been on this section of the trail. There was some kind of running race going on along the canal today so I figured that I would have to look like the usual nutjob taking a picture of the thing, but by the time I got there, there was a break in the runners so no weird looks for me. Interesting sculpture for sure! Thanks for letting me in on the "famous" landmark along the canalway. 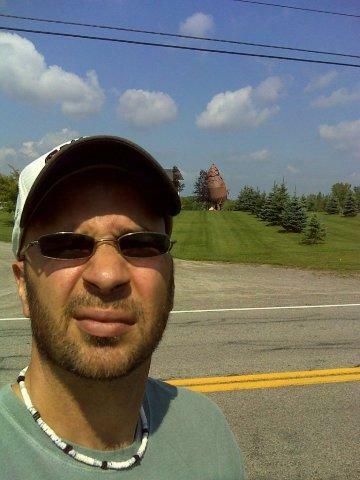 Well I was in the area doing some near by caches when we drove right by the chicken. After recently seeing Mr. Yucks picture and log. I turned around to grab this one. I love to look for strange and fun photo ops. Thanks for showing me this one.